When enabled, the source will be kept cached in system memory. This allows it to be a global source where devices like capture cards will be linked. 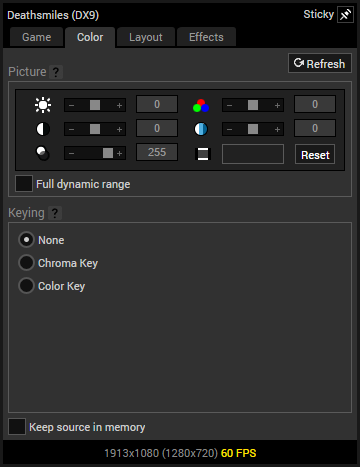 Adjust color controls such as brightness, contrast and hue as well as adding compositing through chroma and color key. Adjust the overall darkness and lightness. Adjust the separation between the dark and light areas of the source. Adjust the opacity of the source. Change the colors used by the source along the RGB color space. Adjust the saturation of colors. Adds a background color to transparent areas of the source. Increases the color range used by the source from 16-235 to 0-255. Best suited for compositing out a range of a specific color. 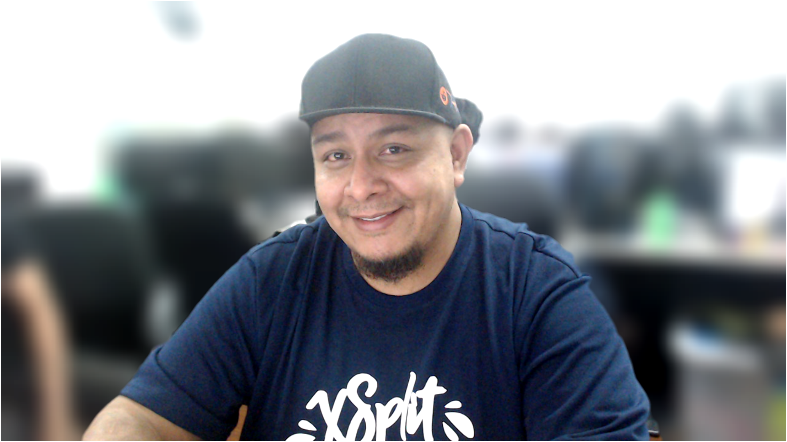 Example use would be for removing green screens and other non-uniformly lit backgrounds. Key Color - Choose which color from Red, Green or Blue to composite out. 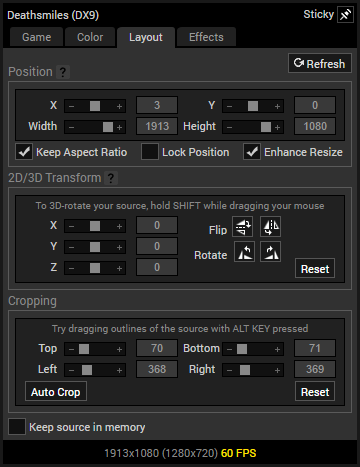 Anti-aliasing - Smoothens the edges of compositing. Threshold - Increase or decrease the range of the shades of the key color to composite out. Alpha smoothing - Smoothes out transparency of composited edges. 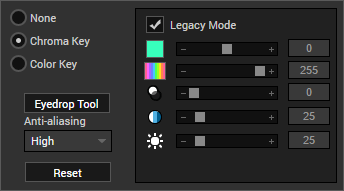 The old version of Chroma Key from earlier versions of XSplit Broadcaster. Best suited for compositing out a very specific color. Example use would be removing colors from images to use as overlays. 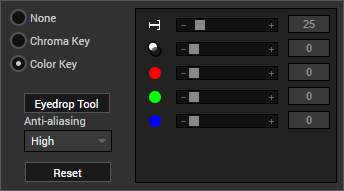 Eyedrop Tool - Used to copy the color from any part of the source to use a the key color. Anti-aliasing - Smoothes out jagged edges from compositing. Red - Adjust the Red value of the keyed color from 0-255. Green - Adjust the Green value of the keyed color from 0-255. Blue - Adjust the Blue value of the keyed color from 0-255. 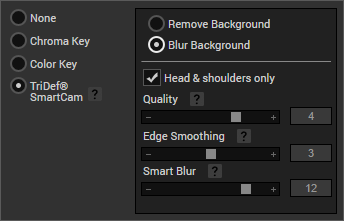 You can copy and paste Chroma and Color key settings by right-clicking on the Keying settings pane. 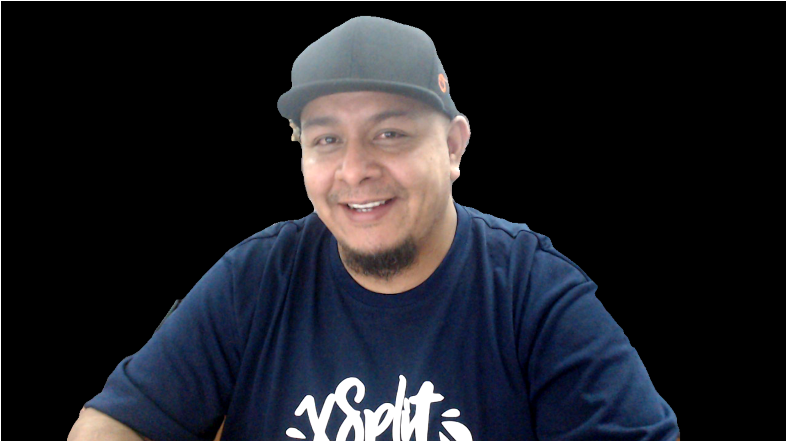 TriDef Smartcam allows you to create a virtual green screen using your web camera or intelligently blur your camera background to improve privacy. You can easily replace your background with an image or video, or overlay yourself on top of your gameplay. You will need to purchase TriDef SmartCam separately to enable this feature. Adjusts the size and position of your source on the stage. Adjusts the rotation of your source on the X, Y and Z axes. Adjusts the cropping of your source on the stage. 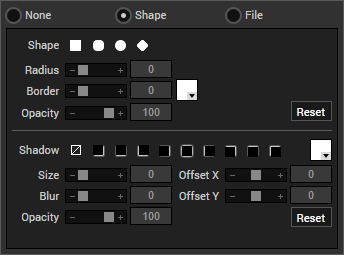 Shape Mask - Applies an opacity mask to the source which can be defined through presets and shape sliders. Outline and shadow effects can also be added to this mask. File Mask - Applies an opacity mask from the alpha channels of an image file. 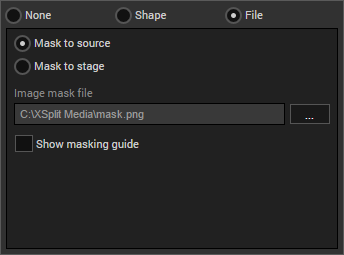 Applying the Mask to Stage, resizes the file mask to the resolution the stage is set in while applying the Mask to Source scales the file mask to the source’s size. 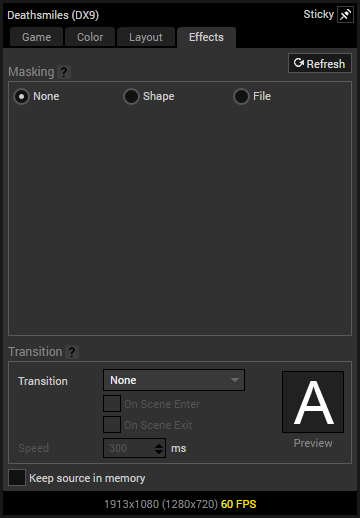 Applies transition effects to sources upon scene enter or exit as well as when they are hidden or shown through the source list. 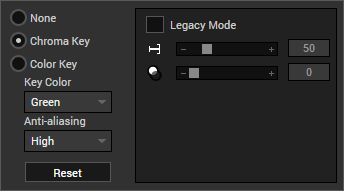 Setting the scene transition to ‘None’ overrides any of the transitions set here.